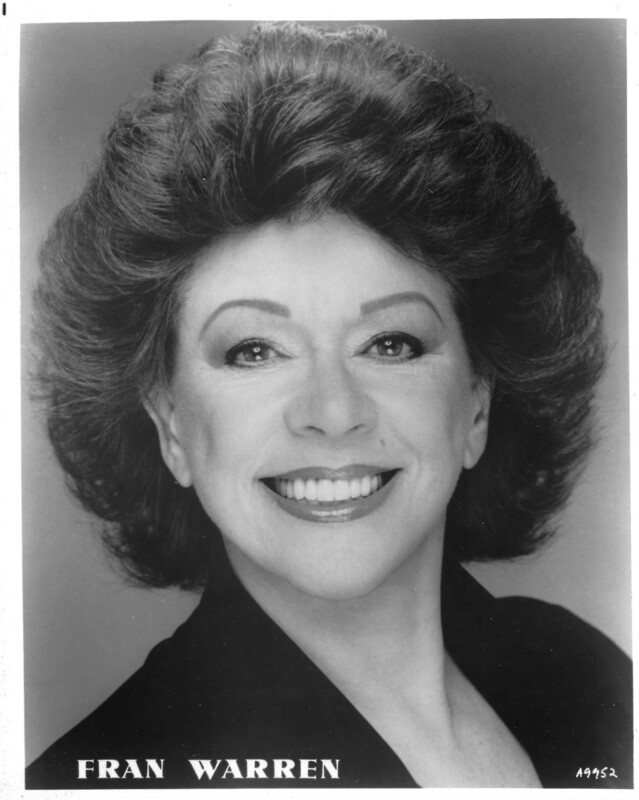 Next up in my series of Big Band Singers who went on to solo stardom, is the fabulous Fran Warren. She started out singing very young, and by the time she was 22 she had left big band singing behind and was enjoying her newfound solo stardom. For a short time in the late 40’s and 50’s she was one of the most versatile girl singers, a vocal powerhouse and physically very beautiful. She definitely was both ear candy and eye candy at the same time! Fran WARREN (March 4, 1926 – ) was born in New York City. She was just 15 when she started out as a chorus girl at the Roxy in New York, and at 16 she auditioned for Duke Ellington’s band without success. She did get to sing with a couple of other bands though, and for the next three years she was very visible and audible around New York singing with the bands of Randy Brooks, Art Mooney and Billy Eckstine. She replaced Kay Starr in Charlie Barnets orchestra, and by 1947 she was hired by Claude Thornhill. In May of 1947 Columbia released “A Sunday Kind Of Love” by the Claude Thornhill band, Fran Warren’s first charted record. It was a good seller and made it into the Top 20. It’s regarded as one of the most soulful big band ballads of its time, and was also recorded later by Etta James. Fran recorded 14 sides with Thornhill during 1947, some notable songs are “I get the blues when it rains”, “We knew it all the time”, “You’re Not So Easy To Forget”, “Love For Love” (with a sax solo by Lee Konitz), “Early Autumn”, which reached 22 on the charts in late 1947, “Tell Me Why”, “I Remember Mama” “Just About This Time Last Night” and “For Heaven’s Sake”. Fran’s complete recordings with Claude Thornhill’s band have been released on CD. By 1948 Fran, who was maybe just too attention-grabbing to be just another band singer, was all set for a solo career. Despite a recording strike going on in 1948, she still managed to make enough records and public appearances to get started on her own. She was signed to RCA Victor records and began recording in mid 1948. 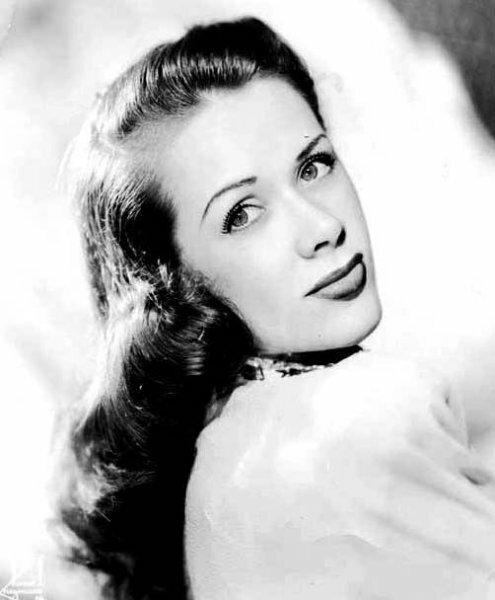 “Why Is It?”, “Joe”, “Why Can’t You Behave?”, “What’s My Name?” were all among her first solo recordings.In July of 1949 “A Wonderful Guy” from the Broadway show “South Pacific” was a hit, reaching number 17. This was followed by “Envy” which hit number 12. She then made a duet with Tony Martin; “I Said My Pajamas And Put On My Prayers”. It’s quite a silly little novelty tune, but none the less performed convincingly. It was stuck in the charts for 4 months and got to number 3. The 1950’s was truly Fran’s golden decade. She spread her talent all around, making a lot of records, she was in an Abbott & Costello movie, she was on TV and did concerts and club dates all around the USA. In the spring of 1950 another duet, this time with Lisa Kirk on “Dearie” was a top 25 seller and was followed by more duets with Tony Martin: “Darn It Baby That’s Love” and “That We Is Me And You”. In late 1950 Fran Warren recorded “I Love The Guy” on RCA #3848, another top 25 seller. Other notable songs from the early 1950’s are: “My Silent Love”, “Look To The Rainbow”, “I’ll Know”, “Stranger In The City” and a cover of Ruth Brown’s recent hit “Teardrops From My Eyes”. Fran also got to record her versions of some well-known standards like “Stormy Weather”, “Over The rainbow”, “One For My Baby”, “I Gotta Right To Sing The Blues”, “Let’s Fall In Love”, “Between The Devil And The Deep Blue Sea” and “The Boy Next Door”. 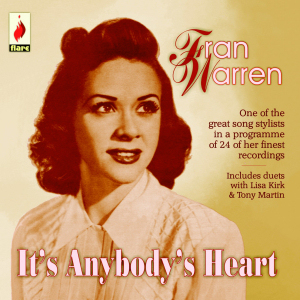 In late 1953 Fran had one last hit on the best seller charts; “It’s Anybody’s Heart”. Strictly more of a pop singer, than a jazz interpreter, Fran could still at various points be considered to have a feeling for jazz, and even the blues. An emotional singer when the material calls for it, she bites into the lyrics and is a convincing performer of songs that need an extra touch of emotion. 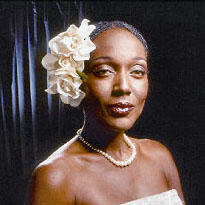 Verve was the leading jazz label from the 1950’s on, and in 1955 Fran had the chance to make an album for them. 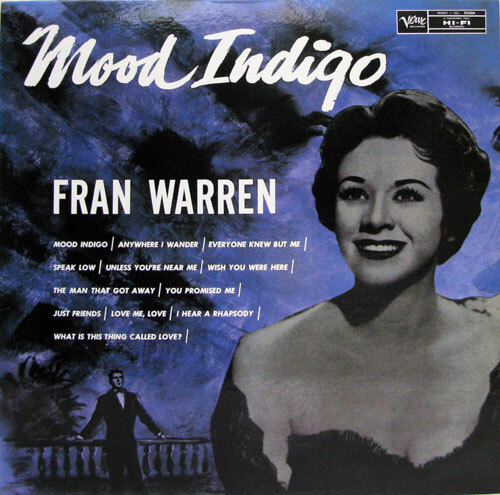 “Mood Indigo” didn’t set the charts or the critics on fire at the time of release. Still, it’s a very good album, and one I’m happy to see now being available in digital version by iTunes. You get none of the cute, funny stuff here – but it’s a perfect chance to hear Fran from her most bluesy and soulful side. The 1955 LP she made for Verve; highly recommended! 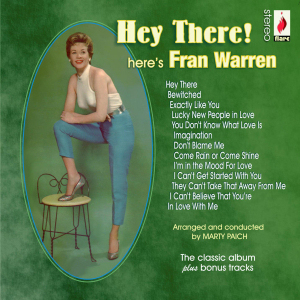 During the mid-50’s, Fran starred in the musical “The Pajama Game” for a long run, and one of the songs from that show was made the title track of the album she made in 1957; “Hey There! Here’s Fran Warren”. It seems to be her most popular album ever, and rightly so. It shows off all the best of Fran’s talent, and is probably the album for which she is best remembered. It has been released in both digital format and on CD. The last CD edition expands the album with 12 bonus tracks, most of them single sides she made around the same time. After the advent of Rock ‘n Roll, Fran – like most other classic pop singers – had to reconsider her musical directions. It’s was either go with the current flow, or stick to your own thing. Luckily, Fran chose that latter – making a very good album in 1962, dedicated to songs from the Great American Songbook, as well as some recent musical hits. 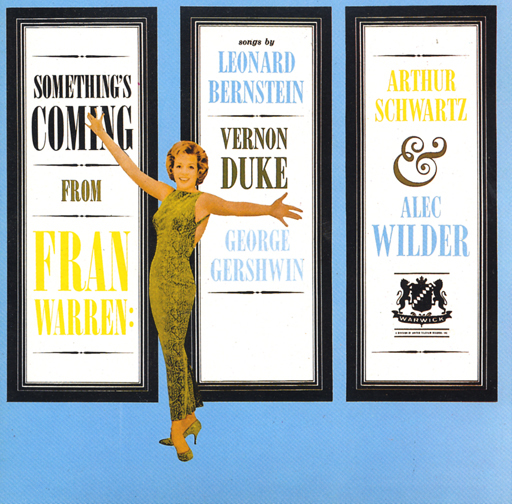 “Something’s Coming From Fran Warren” is currently available again, and it is also highly recommended. Her great 1962 album - get it!! Fran went on tour with Harry James and his band in the mid-60’s, and she also starred in one of the many performances of the musical “Mame” – seemingly well suited to playing the title character. 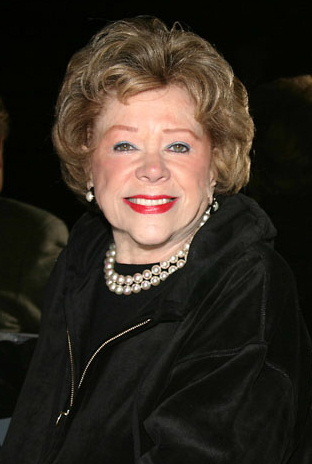 She rounded out the 1960’s by releasing 2 albums in a row; 1968 saw her trying out new directions by going country on “Fran Warren in Nashville”. This album contains the hilariously funny “All American Sport”, about a newly wed bride unable to get her marriage consummated because her husband is just watching sports on TV and running around with his friends to all sorts of games! 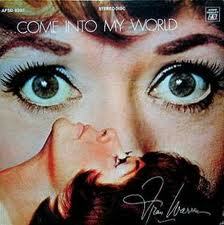 In 1969, another album came out, called “Come Into My World”. This is very much a middle-of-the-road pop records of its time, and Fran does a wonderful version of “By The Time I Get To Phoenix” here, as well as the musical hit “If I ruled the world”. As far as I know, this 1969 album marks the last time Fran recorded. I know of no other records being made after this, even though she kept on singing actively for many years. She seems to have worked very little during the early 1970’s, but by 1979 she was once again back on the scene. Hooking up with trumpet player Joe Cabot, the two of them toured with a revue called “The Big Broadcast of 1944”. They did this for 3 years, ending with a couple of sold-out engagements in 1982 at “Michael’s Pub”, a very popular New York Jazz Club. Fran, like many of her colleagues from the 30’s and 40’s, was also seen on TV’s “Juke Box Saturday Night”. She was still sounding good, and looking as though her debut record from 35 years earlier must have been made at the age of 10! From the mid-1980’s, she seems to have faded from view, and settled in Connecticut. I’m sure she’s happy about the fact that most of her wonderful recordings have been re-released during the last two decades, and she’s probably gained a lot of new fans who weren’t around when she started out almost 70 years ago. She still makes public appearances every now and then, but as a singer she seems to have gone into a complete retirement, one that has lasted – at this writing – into her 87th year. Fran might have yearned for a “Sunday kind of love” way back 65 years ago – but I think she will receive love every day of the week from anyone who’s heard her sing. She easily ranks with the very best of the classic pop singers of the 21st century! Fran at the age of 78, attending the celebration of cabaret singer Hildegarde's 98th birthday. Still looking great! Sharon Redd – 20 Years On…. 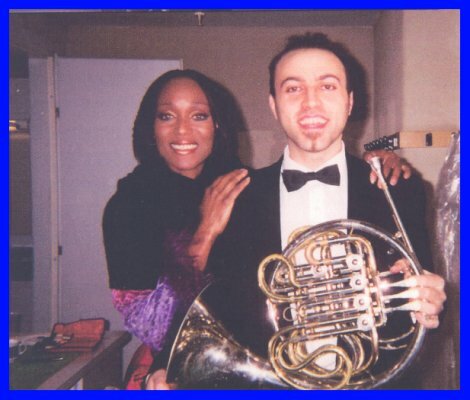 On May 1st 2012, it will be 20 years to the date since Sharon Redd died – I can hardly believe it… Must be because her music lives on, and she still lives through her music. There can’t be anyone over the age of 40 who hasn’t, at one time or another, danced to some of the great club hits she recorded. As a solo performer, her career encompassed much more than most people are aware of, and due to her much too premature death, I feel a loss of music that could have been – if she’d lived longer…. 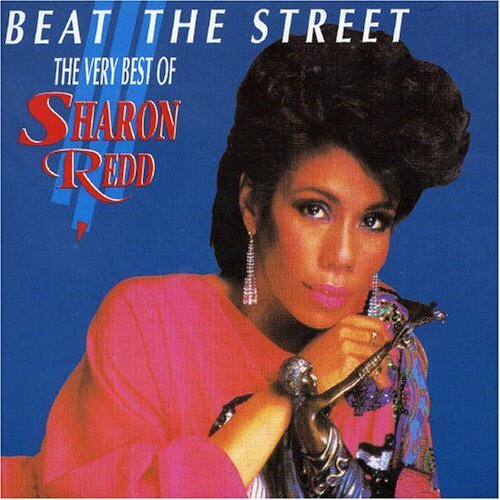 Sharon Redd (19 Oct. 1945 – 1 May 1992) may be first and foremost remembered for a lot of dancefloor-filling club hits of the 80’s, but before those came out she had done a whole lot more! She started her recording career in the late 1960’s, and released a total of 6 singles during the next 4 years: “Half as much” (1967), “Do you want me?”, “I’ve got a feeling”, “Since I lost you” (all 1968), “Easy to be hard” (1969), and finally “Where the mind can breathe” (1971). All these records helped her to establish a reputation as a very fine R n’ B singer with an expressive voice. They reveal a much more soulful Sharon than what you find on most of her club hits of the 80’s. After 1971 there were no more records for quite some time, but Sharon branched out into acting. Her first major part was in the Australian production of “Hair” 1969-71, and Sharon stayed with the play during its entire run – becoming quite a star in Australia also! She appeared on the TV programme “GTK”, she made a fabulous commercial for Amoco Oil that was seen all over the country and she got to starr in her own Television Special! Later on, she was featured in the American TV sit-com “Rhoda” playing the role of Sherrie. She had a starring role in the London production of “The Wedding of Iphigenia” in 1974, and you can see her in a smaller part in the 1978 movie “Sgt. Peppers Lonely Hearts Club Band”. 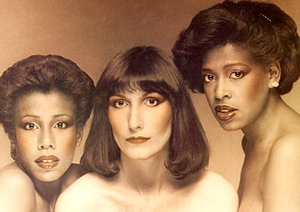 1979 saw the release of the song for which she is maybe best remembered; “Love Insurance”. For some reason this record never carried Sharon’s name – with the label reading “Front Page”. If any band of that name really existed, they were a studio product only, and it is Sharon who should be given all credit for this classic disco hit. It’s widely available under her name now, and can be downloaded from most music sites. Its almost seven minutes is pure musical bliss, and when she shouts “Surrender, baby!” during one of the breaks, that’s the only thing to do! Right after “Love Insurance” hit, she was offered a contract with Prelude Records, quickly being turned into that labels “First Lady” and making three albums in quick succession for them. Her first album was titled simply “Sharon Redd” and she had big hits with songs like “Can You Handle It” and “You Got My Love”. 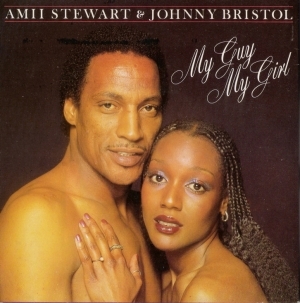 The album also includes two songs that should have been hits; “Try My Love On For Size” and “It’s A Lie”. Her next album, “Redd Hott” came out 1982, and she scored more hits with the songs “Never Give You Up”, “Beat The Street” and “In The Name Of Love” – ALL of them bona fide club classics, and ALL of them reached number 1 on the Dance Chart! 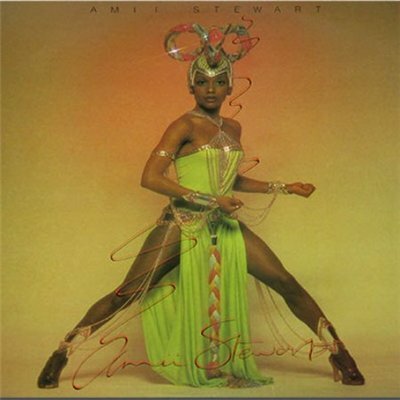 Her final solo album, “Love How You Feel” (1983) kept the hits coming with “You’re A Winner” and “Somebody Save The Night” – songs that will guarantee packed dance floors anywhere. The album also included “Activate” and the totally gorgeous “Liar On The Wire”. All three of her 80’s solo albums are available as downloads from iTunes, and they have been re-released on CD as well. There are numerous compilations out there too, most them compiling her biggest hits, so if you want just those – anyone of those will do. For those of you who want it all, go for the three solo discs altogether! They contain a lot of great music, performed by a woman whose smooth, soulful but still strong voice will no doubt leave a lasting impression on music lovers! Although there were no more solo albums, Sharon kept on working in the music business. She was a prominent back-up singer for the group Soiree, and she made a duet with Les Adams called “All The Way To Love” – the last time her name would appear on any record. She was gradually fading from sight in the later part of the decade, but “Beat The Street! 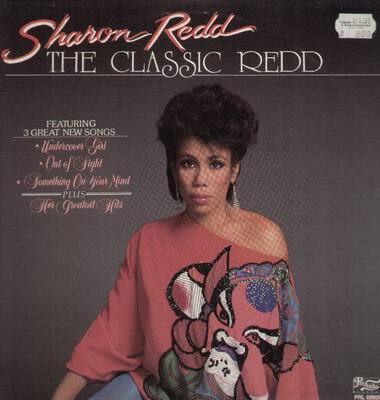 The Very Best of Sharon Redd” came out 1989 and caused some flurry of activity. This hit collection includes a 15-minute “Mega mix” of all of her greatest hits. When Sharon suddenly died in May 1992, at just 46 years old – the music industry was shocked; Though never a superstar diva, she had been a consistent hit maker for some time, and as a person she seems to have been very nice, as everyone who’ve met her will tell you that she was just wonderful to be around. 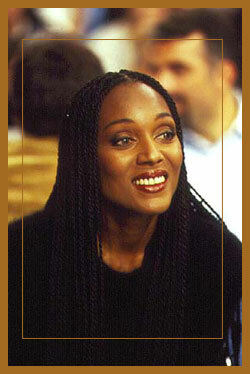 The cause of death was given as pneumonia, then a magazine published an article stating that Sharon had died of AIDS, and that the pneumonia was just a sideline to her much more serious diagnosis. Personally, I don’t care – she was a wonderful singer who died much to young, whatever the cause of it was. If I sometimes feel like dancing, chances are that it’s one of Sharon’s discs I play. And I like to believe that she sits on the edge of a cloud, tapping a high-heeled foot to the beat and smiles that half-shy smile of hers. As a singer, she was one of the very few who could put some soul and sincerity into the electronic beats of 80’s dance music – and that is one of the main reasons I’m such a fan. She cuts straight through the sonic melee, aiming for your heart….. “Surrender, baby!” – Yes. miss Redd – I’m all yours…!